A weekend party of three left a wet Donaghadee Harbour on Friday evening. It took the Copeland Shearwater RIB around 10 minutes to get to the South Jetty on Old Lighthouse Island. Once on the Island, the party made their way up to the Observatory building to get settled in for the weekend. The persistent rain limited the outdoor activities of the party for that evening. The Chris Bailey Hide provided a suitable refuge for seabird watching. Early morning netting on the Saturday was quiet with no new birds ringed. The weather looked promising for the arrival of the roof working party that day. 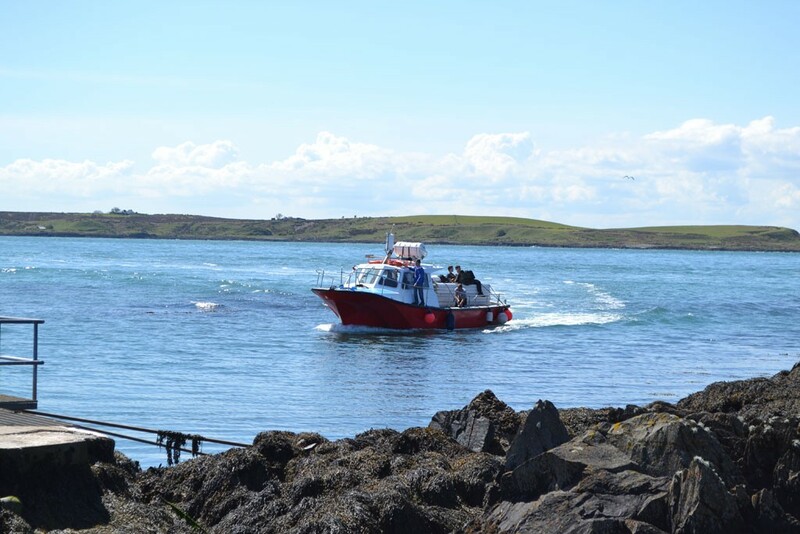 The weekend party were able to watch the chartered boat leaving Bangor on route to Donaghadee Harbour to collect the first of the roofing materials. This information was passed to the awaiting party on Donaghadee Harbour via mobile phone. The chartered boat carrying the first of the roofing material arrived at the South Jetty around 10:45am. 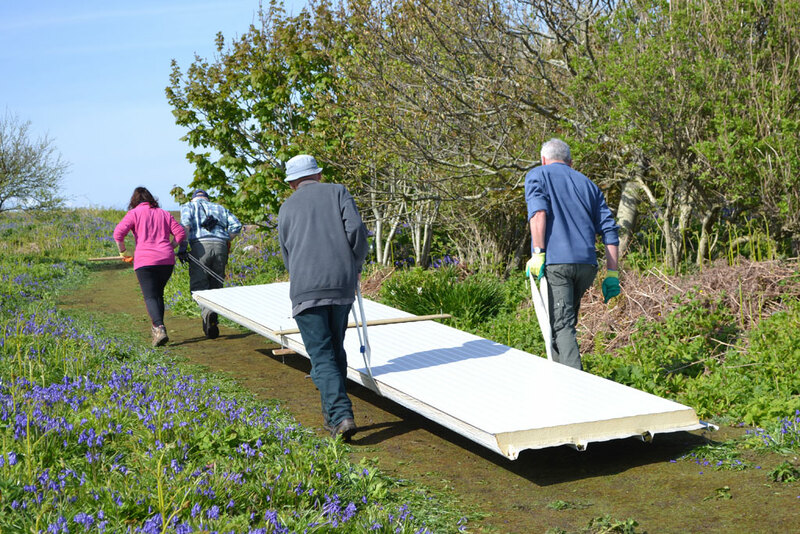 Some members of the work party arrived with the materials while other members remained at Donaghadee Harbour to assist with the next load. 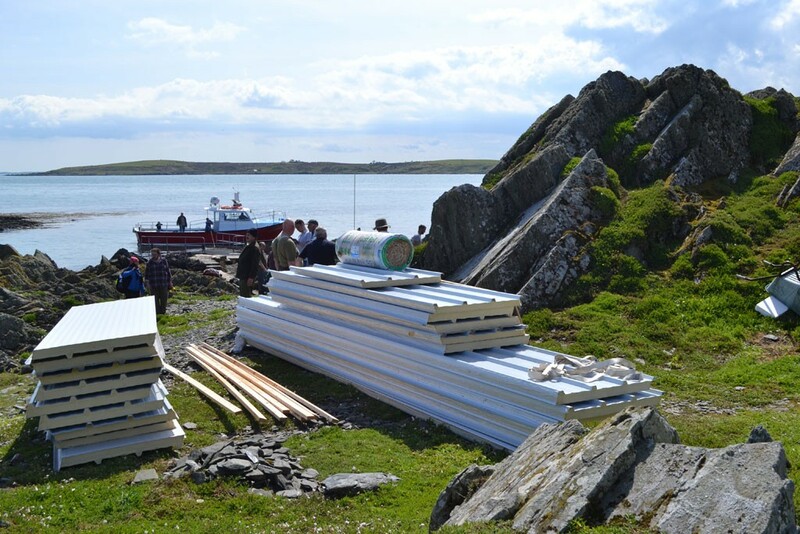 Once docked, the roof panels and building materials were unloaded from the boat and left on the foreshore. 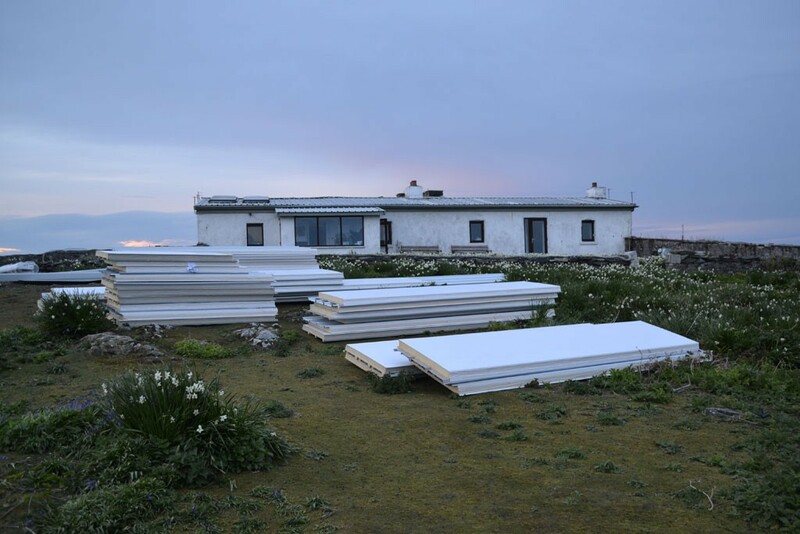 While the boat returned to Donaghadee to pick-up the next load, the work party on the Island started to bring the heavy materials up to the Observatory building. Wheelbarrows and other improvised lifting methods were employed to move the roof materials up to the Observatory building. This operation continued for two more boat trips. By the time the third and last boat was unloaded the water was up to the top level of the South Jetty. Another half hour or so and this jetty would have been unusable. 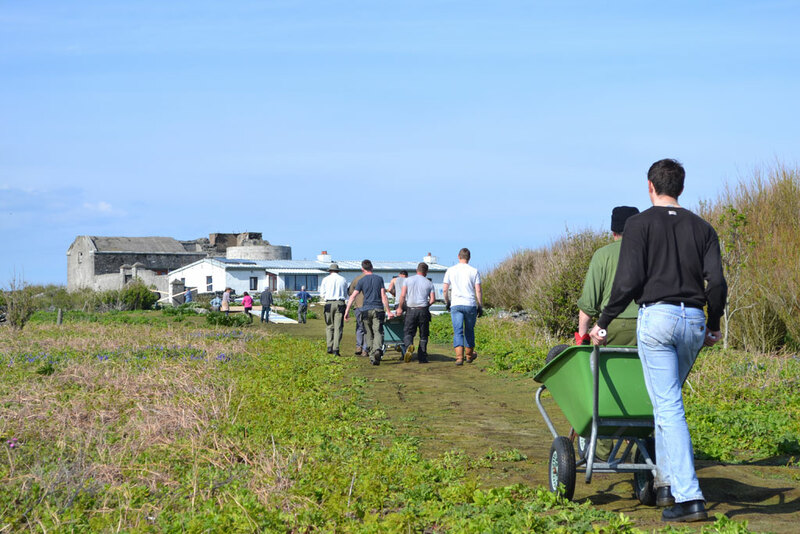 After a hard day’s work in the sun, it was time for the Saturday work party to leave. The Copeland Shearwater arrived at the East Jetty around 5:30pm to lift the remaining work party members. This had been a very successful day, with everyone working efficiently together to get an important job done. Sunday was overcast with strong winds as forecasted. Rope was used to secure the stacked panels together to prevent them from lifting. Three new birds were ringed that day, with one re-trap bird. The weekend party left from the East Jetty on the Sunday afternoon. The strong winds made the return journey on the Copeland Shearwater a little choppy. Despite some mixed weather, the weekend was productive and enjoyed in good company. Over the weekend, reasonable numbers of Swallows were seen on (or perhaps moving through) the Island. The odd Swift, House Martin and Sand Martin were also spotted. Four Puffins were in the water just north of the East Jetty. 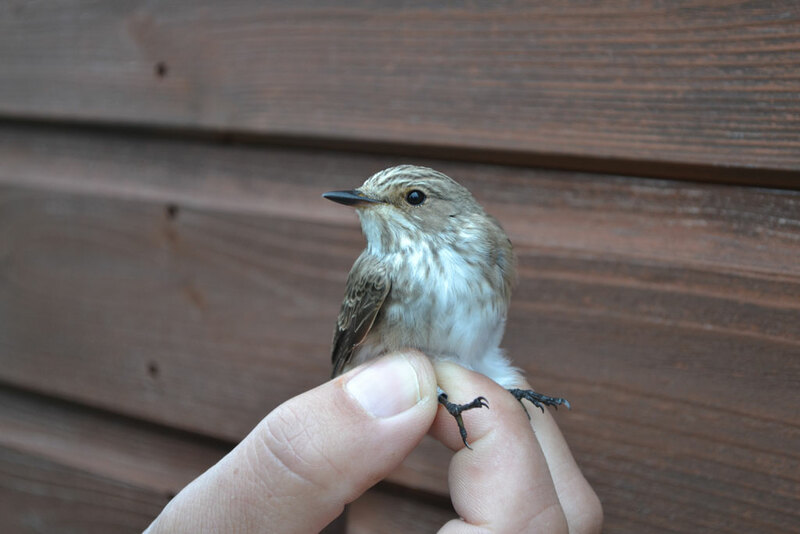 In total, three new birds were ringed (Willow Warbler, Chiffchaff and Spotted Flycatcher) with one re-trap (male Reed Bunting).